TfL have been playing with the Circle line over the weekend. They've been practising for December, when the orbital route is split apart and all the trains start/finish their journeys at Hammersmith instead. The Circle will be broken at Edgware Road which then becomes a key interchange hub. But can this ageing station cope? I'm not convinced. It ought to be simple. Each of Edgware Road's four platforms will have its own dedicated service, so all passengers need to do is go to the correct platform and wait. But over the weekend, without even any temporary signage in place, it didn't feel simple at all. Now wonder the member of TfL platform staff I spoke to described his weekend experience as a "nightmare". "Last and final stop. This train terminates at Edgware Road. Please cross to platform 1 to complete your eastbound journey. All change please, all change." It's hard to see that the driver could have done more to inform passengers about what was going on. Even so, only 80% of the train's passengers disembarked. The rest sat where they were, either because they "knew" that Circle line trains didn't terminate here or because English wasn't their first language and nobody had warned them in advance that the Circle was no longer a Circle. Eventually most of the non-movers twigged, but some sat tight in blissful ignorance. Meanwhile the first westbound passengers clambered on board, ready for their Circle line journey to High Street Kensington and Victoria. An over-stretched member of TfL staff moved down the platform, knocking on each carriage in turn and yelling "All change, all change please!" Passengers duly disembarked, even those who'd just got on because they actually knew what they were doing. A fluster of animated conversation with the member of staff ensued, and the westbound passengers re-boarded the train they'd boarded correctly in the first place. One particular Spanish couple stood baffled on platform 2, trying to work out what to do next. They had a pair of large suitcases in tow, no doubt fresh from the Heathrow Express at Paddington, and their command of English wasn't great. "Tower Hill?" they mumbled. TfL-Bloke directed them towards Platform 1 and told them to catch the next Circle line train. Absolutely right, mate. Alas the first train to arrive was an eastbound Hammersmith and City train, and the Spanish couple needed a lot of persuasion not to climb on board. 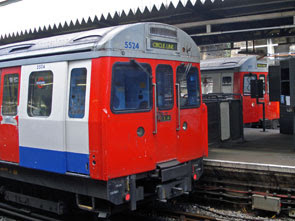 Meanwhile the westbound Circle line train on platform 2 closed its doors and set off. It struck me that this train was actually going to Tower Hill, but the couple had been advised to get off it and wait for a train going round the other way. This should have been good advice because the clockwise journey's normally quicker, but not in this case. A lengthy wait ensued and no eastbound trains arrived at all. Circle line trains will run less frequently under this new revised timetable (six an hour, rather than seven an hour) so expect to wait up to 10 minutes in the future. The "next train" indicators provided no useful information. The system at Edgware Road is supremely useless - ancient boxes with weedy red text, and seemingly unable to announce any arrival until a minute before it happens. If they're not upgraded before December when Edgware Road becomes a key Circle line hub, I'd expect customer annoyance and dissatisfaction to be high. Another Circle line service arrived on platform 2, and another few hundred people crossed to platform 1 to complete their eastbound journey. Meanwhile some of those already waiting on platform 1 crossed back to platform 2, thinking an eastbound Circle line train had finally arrived. Wrong, it terminated here, all change please. The new influx of passengers waited semi-patiently, adding an extra five minutes to all of their journeys, before the next eastbound train finally appeared. This was another Hammersmith and City line train, to Whitechapel, and it was already fairly full. Within seconds it was a lot fuller. The Spanish couple looked around for assistance, but within such a large crowd there was none. They tried checking their tube map, but it didn't actually show the weekend's temporary service and wasn't much help. Eventually, just before the doors closed, they clambered aboard and set off in cattle class conditions. I hope they changed trains before Aldgate East, because it's no fun lugging a pair of suitcases across from one platform to the other, and it's a mighty inefficient way to get to Tower Hill. They should have waited. One minute later a Circle line service finally arrived, going precisely where they wanted to go, and it was nigh empty. Ah, if only they'd picked a different weekend to travel, one when they'd not been forced to change trains at Edgware Road. Alas, come December, none of us will have that option.